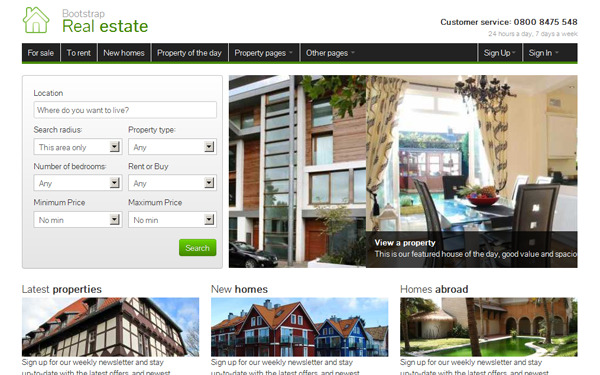 Bootstrap Real Estate is a professional template for selling properties. The theme makes use of a carousel plugin and also uses google maps API to show locations. If you want to make your own real estate website, there's little else you could want. Bootstrap Real Estate is a professional template for selling properties. It's also very easy to change the images of this template to transform it into a hotel website, car selling website or even a local classified website. It's designed entirely using Bootstrap. It's compatible with any of the themes from http://bootswatch.com/. You can also easily add and remove components as it's based on the Bootstrap framework. The theme also makes use of a carousel plugin and also uses google maps API to show locations. If you want to make your own real estate website, there's little else you could want. Don't forget! Because you're using a theme built with Twitter Bootstrap, you get access to everything in the Bootstrap component library and ecosystem. This makes Bootstrap Real Estate an excellent choice for your next project. Property images are not licenced.